"Works well under harsh weather conditions and while using heavy equipment." "These work gloves are insulated and protective at a wallet-friendly price." "According to reviewers, these gloves stayed relatively toasty." "A traditional ranch hand-type pair that stands up to harsh climates." "Wicks away sweat and moisture from your skin for added comfort." "Thick padding helps minimize vibrations from gas-powered tools and machines." "Made from top-grain leather with a spandex back for extra flexibility." "Durable and protects hands during all sorts of construction jobs." Versatile yet still affordable, the CLC 125M Handyman Flex Grip Work Gloves are a cinch for our top pick. 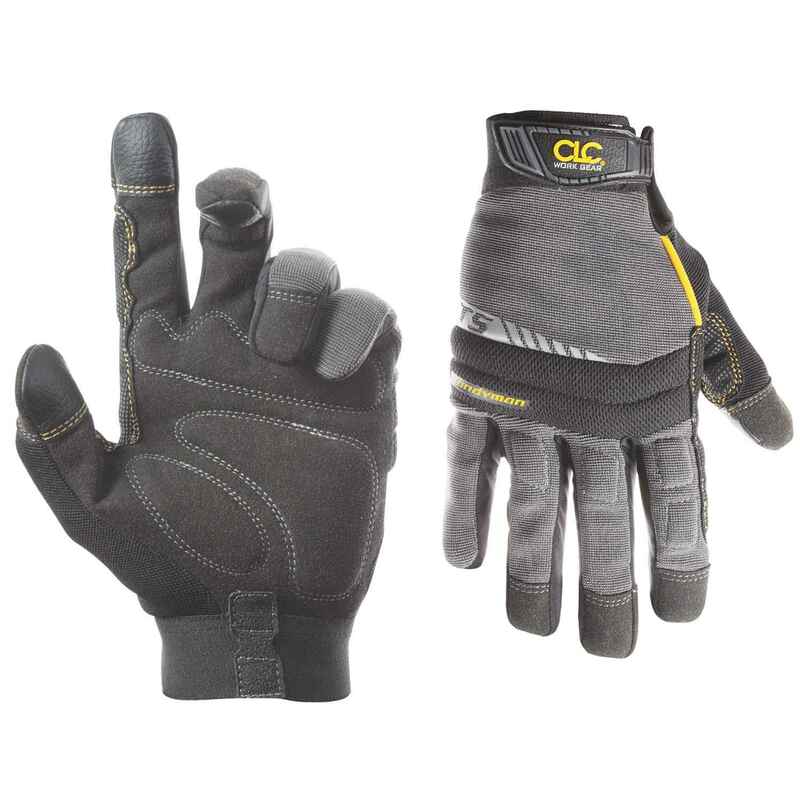 With concealed stitching that won’t snag on jagged metal or rough wood—as well as wing close straps to keep each glove from slipping—this pair works especially well in harsh weather conditions, wet environments, and while using heavy equipment. Also, although they're form-fitting, they're also comfortable: their spandex back, Syntrex-padded palms, and Lycra side panels ensure that you can move freely. Plus, with three touchscreen-friendly fingertips per glove, you can use your use smartphone or tablet without missing a beat before you get back to work. These work gloves are insulated and protective at an extremely wallet-friendly price point—you can often find a six-pack for around $10. Their nitrile (synthetic rubber) coating is breathable yet sturdy, while their 100 percent nylon shell helps you stay flexible in both wet and dry conditions, making them ideal for activities like cooking and gardening as well as welding and woodworking. Online users also raved that their fit was fantastic at any size and that their grip was superior to other general work gloves. Also, according to reviewers, they slip on smoothly and won’t slide around when tackling thorny jobs or handling cumbersome pieces of metal or wood. Take a look at other product reviews and shop for the best gardening gloves available online. When you're working in snowy or severe weather conditions, you need gloves that are durable, warm, and flexible. The Black Diamond Soloist Gloves check all of these boxes. Their nylon-spandex shell is abrasion-resistant with a four-way stretch, while their palms are made from a patch of Kevlar-reinforced goatskin. Additionally, their removable liner is 100 percent waterproof with extra insulation on the back, wicking moisture from your skin and drying quickly once removed. According to online reviewers, these gloves stayed relatively toasty, even after hours of working in wet conditions. In the market for other winter tools? Take a look at our selection of the best snow shovels. There are many types of leather work gloves to choose from—including deerskin, goatskin, cowhide, and pigskin—but buffalo hide is known for being especially tough and long-lasting. Midwest Gloves & Gear makes a traditional ranch hand-type pair that stands up to harsh climates especially well. Design-wise, the sheared elastic wrist has a hemmed cuff for a snug, classic fit with no pieces that could get hung up on fencing, metalwork, or fiberglass. Plus, the gloves aren’t lined so you have more agility and a wider range of motion. Featuring Carhartt's FastDry® technology, these gloves have a waterproof lining that wicks away sweat and moisture from your skin for added comfort. Their snug fit also prevents water, debris, and snow from seeping in at the wrist, and their Polytex shell has a reinforced polyurethane palm for extra durability. Although the fingers are a bit bulky for wiring or other more delicate work, these gloves are very warm, making them ideal for shoveling, clearing tree limbs from the yard, and moving cargo in harsh weather. Reviewers also liked how easy they were to pull on or off, even when wet. It’s easy for accidents to happen while doing landscaping work—simply wearing the wrong gloves can send you to the emergency room if something goes awry. The Black Maxx Blade gloves are an excellent way to ensure you stay safe and comfortable on the job. Made from a combination of knit material (60 percent Kevlar and 40 percent cotton) with a black chloroprene coating on the palm, this pair is both cut- and puncture-resistant. Their thick padding also helps minimize vibrations from gas-powered tools and machines, but they aren’t bulky as other work gloves—making them ideal for completing tasks in tight spaces. A great pair of metal working gloves can help you do a potentially dangerous job quickly and safely. These gloves from Miller are made from top-grain leather with a spandex back for extra flexibility. Plus, they're sewn with 100 percent flame-resistant Kevlar thread and both their palm and thumb saddle are padded and reinforced for extra comfort. Lastly, the slender design of the fingers makes it easy to operate solder irons and other tools while protecting hands from sparks and sharp edges. For a lighter-duty work glove, the Carhartt Grain is as good as it gets. This pair holds up to scrapes, splinters, and abrasions from hammering, lifting, welding, and sawing work. The area around the palm is made from full-grain leather and is reinforced with suede. The gloves also have has a polyester lining, safety cuff, and full side vent for easy removal. One downside, however, is that these gloves can feel bulky and harder to maneuver, but overall, they're durable and protect hands during all sorts of construction jobs. For any project you're working on, check out our selection of the best mechanic tool sets you can buy today. Our writers spent 15 hours researching the most popular work gloves on the market. Before making their final recommendations, they considered 22 different work gloves overall, screened options from 13 different brands and manufacturers, and tested 7 of the work gloves themselves. All of this research adds up to recommendations you can trust.